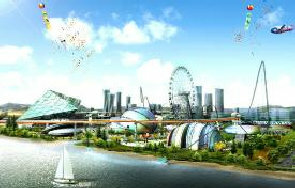 Theme Parks Rocks Korea Tourism! Theme Parks are so much fun and the future is here ... what you're seeing here is Robot Land, scheduled to be completed in 2013 at Incheon, Seoul which will send South Korea tourism spiraling! Robot Land is planned to feature all manner of robot entertainment mostly from films that featured robots such as I, Robot and The Matrix as well as Minority Report. I actually don't remember any robots in Minority Report. As far as rides go, there is a robotic arm ride, as well as some sort of aquarium that allows visitors to watch and manipulate robotic fish. I'm told that there will be robotic performers and cashiers, which should save money on human labor. Just kidding! Robot Land is expected to boost the national economy by creating 18,000 jobs to serve the 2.8 million visitors. By the way, there is more to populate Robot Land than just robots. Robot Land is also a technological park for residential complexes and office buildings. Of course, I think we all know what is going to happen next. Remember that episode of The Simpsons where they went to a park inhabited by 'Itchy and Scratchy' robots? As I recall, it didn't take them long before the robots just up and attacked the humans. Yeah, it's Wild Wild West afterall. However, we have hopefully learned from science fiction and won't make the robots in Robot Land sentient, yet. Nothing like a bit of fun and entertainment at the theme parks to be enjoyed by children and adults alike!